Prolotherapy, or proliferation therapy, is the injection of a solution to stimulate the growth of new cells to heal painful areas. Ligaments are the most common sites for injection although muscles and tendons can also be treated. Ligaments surround all our joints. They protect the joint by limiting its range of motion. They also have a generous nerve supply so if they are stretched, they cause pain. The pain signal helps protect the joint from damage. Our ligaments lose their tensile strength over time and become less resilient and more lax. These structural changes in the ligament predispose them to injury. Ligaments can also be injured through traumatic events. Will I benefit from this treatment? First, we need to determine if you are a good candidate for the procedure. Remember to bring any recent physical therapy reports, x-rays and MRIs that you previously had done. This information is very important in determining appropriate treatment options. The injections consist of a mixture of local anesthetic, Lidocaine, and Dextrose (sugar). The sugar solution is concentrated and causes a local irritation to the ligament, tendon or joint space. The contents of the injection are safe and do not create long term problems. 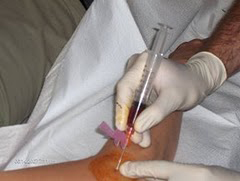 The injections are also given in specific areas that are easy to locate so injecting inappropriate areas are avoided. The common risks when puncturing the skin include infection and bleeding. The needle caliber is small so these risks are rare, minor and easily treated. A very small percentage of the population is allergic to local anesthetic agents like Lidocaine. If you believe you are allergic to Lidocaine please bring it to my attention before receiving your injection therapy. The injections are uncomfortable but the local anesthetic removes the pain quickly. Most patients are able to continue with their usual daily routine after the injections. Most patients will feel stiff at the injection site for a day or two afterwards. Changing position regularly, gentle activity, stretching and moist heat are all that is usually needed to calm the stiffness or discomfort. Tylenol can be used for more significant discomfort but avoid using anti-inflammatory medications (Advil, Aleve, Ibuprofen, Advil or Motrin). Stress or other stimulants that are found in cold medications can cause muscle tightening. Try to avoid these or consider relaxation training for stress. Most patients require anywhere from 2-6 treatments. Male patients tend to require fewer treatments. You can expect to see continued improvement in function and pain relief several months after the last injection. What follow-up treatments are necessary? It is important to continue to see your physical therapist or chiropractor during the post-injection stages of treatment. Ongoing therapy helps to keep the ligaments and tendons strong and flexible. Can I exercise after my injections? Stay as active as possible without aggravating your condition. Walking everyday is usually safe. A gradual return to your sport can be coordinated with your physician and therapist. Your first appointment will include a history, focused physical exam and consultation. It is very helpful if you can bring prior x-rays or MRIs with you to your first appointment. The reports are not as helpful as the actual images. Please arrive 15 minutes prior to your scheduled appointment in order to fill out any necessary paperwork. A registration packet is available on our website at ocsportsandwellness.com that you can print out and complete prior to your visit. Please wear appropriate loose fitting clothing that allows for access to the area of your pain or concern. For instance, please wear a tank top or sports bra if you are a female with a shoulder concern or wear shorts or sweat pants if you have a knee concern. In summary, prolotherapy is a relatively safe procedure that will help to strengthen injured ligaments and tendons. Proper assessment and follow-up is very important.